Sandwiches are an inalienable human right! Don’t let big bread get in the way of our lunches! Egg salad for all who choose it! 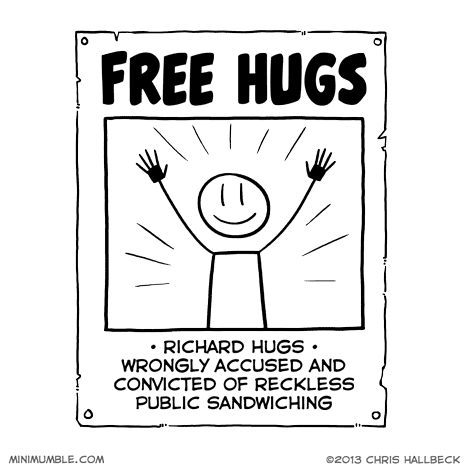 I swear to God any person who hugs me without warning is going to regret it for the rest of the week. Public sandwiching is okay if the sandwich offered is peanut butter and pickles. Chihuahua and Manx for me! Wow. Never met a humanitarian. @ZeoViolet: That’s simply because you have different tastes. Honey and Guatamala! I’m sorry, what was the question? pb&j. maybe some fluff, too. but then a big, warm scoop. chris, you need to make a version of this for shirts.